Salt and butter at the ready. Yum! Don't peel, just boil in salt water and then eat as is, with some salt and "proper" butter. I honestly hope that Lidl and Aldi eventually take over the supermarket wars and win.Lidl always wins for fresh produce imo.Have some heat buddy. 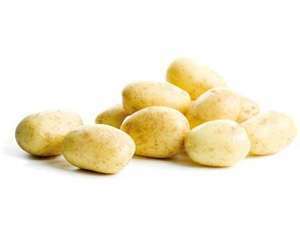 If you eat a lot of potatoes, save yourself some money and buy a 10kg sack from your local greengrocers. You'd be surprised how cheap it can be, from £3 to £5 at some places for 10kg of washed ones. It has the bonus of supporting local business as they're more likely to be UK grown spuds than those in supermarkets. Lastly, if you're buying 10 or 5kg or washed, try not to buy them in plastic bags. Potato sacks are best as they don't let the light in so they won't sweat.